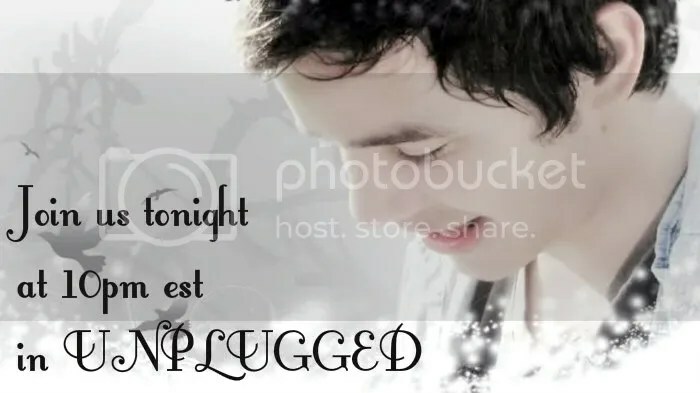 Many are getting ready to watch American Idol and I’m happy that many continue to enjoy the show that brought us David Archuleta. I will eternally be grateful to them for that. I haven’t watched AI since season 7. I have tried many times but I just can’t find any enjoyment from it. I confess that my ears only crave David’s voice and none other will do. 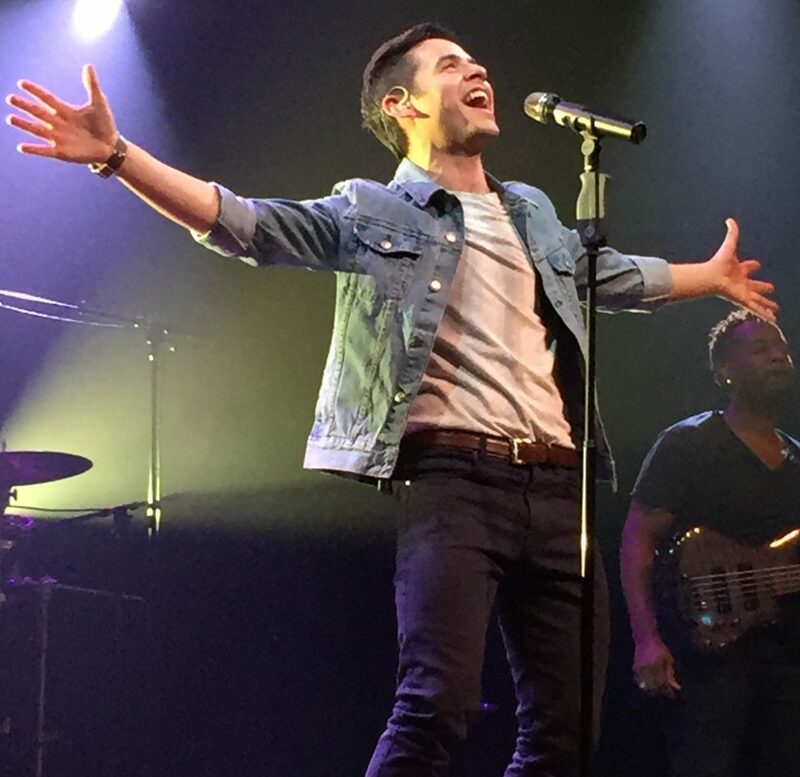 This young man stole my ears, heart and soul through the course of his run on American Idol with his voice, passion, soulfulness, humility, genuine character, smile and heart. 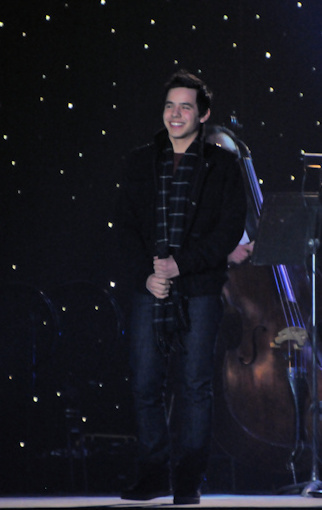 What were some of your favorite David Archuleta American Idol performances? 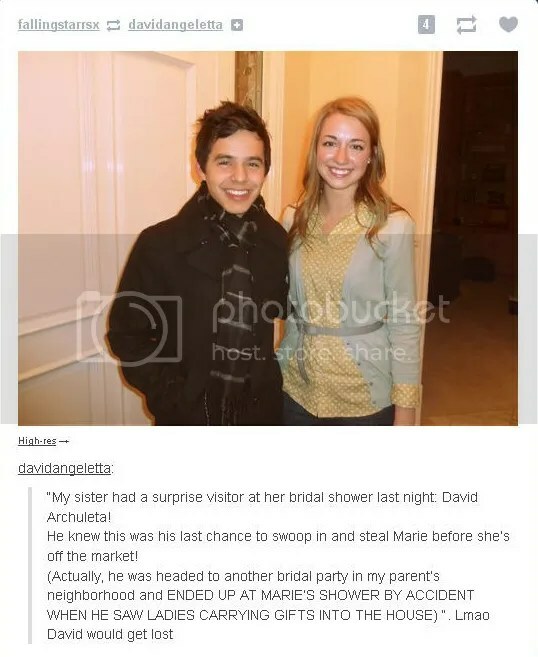 This entry was posted on Wednesday, January 16, 2013 at 8:22 PM	and is filed under @DavidArchie, American Idol, Appreciation, music. 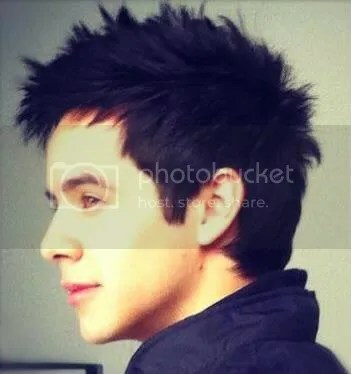 Tagged: American Idol, David Archuleta. You can follow any responses to this entry through the RSS 2.0 feed. You can leave a response, or trackback from your own site. The note at 1:37-1:40 killer! He told the story so gently. Owns this song now, sorry Billy Joel. I am watching Idol 12. The jury is out on the new judges as far as I am concerned. Focusing on the “talent” but it’s kinda lightweight. Hoping for a good bunch for the top 10. I will not be watching Idol. I have had no interest in it since David. I had never watched it before David but something just made me tune in that year and I am sure GLAD I DID! I resisted it for so long but through dja’s recommendation, I found a singing show I like better. “The Voice” (funny name, eh?) is a much classier show. It doesn’t try to boost ratings by showcasing amateurs and making fun of them like AI does. It goes where AI doesn’t and focuses on talent. Ayayayayay….My curiosity got the better of me again tonight and I turned on the last half hour of AI. With one or two exceptions, same old same old. I’m no longer hooked. Here are my top 2 AI performances for David from Season 7. I confess. I did watch Idol tonight. I almost turned it off during all the drama. 15 minutes in and it was still about the judges bickering. But then it started moving along so I stayed. There was one that I hope makes it to the top 10, a young girl with hearing problems which should be a problem for her, but she had a really nice voice. I don’t see anyone though who even remotely compares to David for me. Don’t know if I can stand the new judge Micki Minoj or whatever her name is. She talks so much, it’s like would you shut up and let Keith talk! Love Keith Urban and have always liked Randy and Ryan(sometimes)! haha I felt that David got the shaft when he was on there but I am somewhat over that with Simon gone now. Didn’t like what he and Ellen said about David so I will never watch Xfactor with him on it. Nope, don’t like Simon at all….or Ellen. I love “The Voice” also. The concept is so different and very entertaining. Nope, I’m not an Idol fan. I’ve not been diagnosed with restless leg syndrome, but I certainly get all the symptoms when I sit down and try to watch AI. But then, I don’t watch much TV and never any reality shows. AI7 was the one shot I gave reality TV. I’m certainly glad that I did. I love the Hero duet with Cook. To me it showcased David A’s ability to jump from melody to harmony and back again. 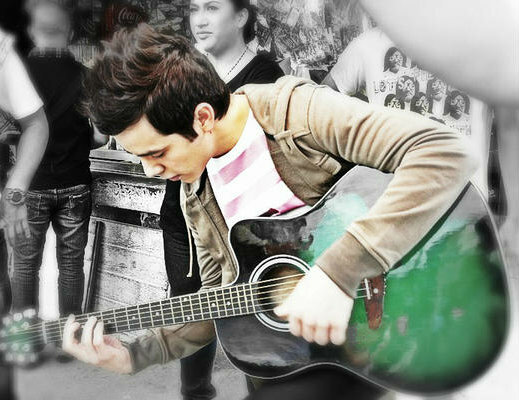 He is able to harmonize like nobody else, and blend with anyone’s voice and become one. I also really, really like the Apologize segment with One Republic. Once again, this song is now David’s. 😉 By this time the pressure was gone and he was able to enjoy his time. I have other favs, but these two are always up towards the top. Jans, I like your novel 🙂 I still watch some reality shows for entertainment. The Voice didn’t have anyone that remotely compared to David but it was fun to watch as well as Dancing With The Stars and of course a novela. The one I’m watching now has a Chilean actor that was also on DWTS, Christian De La Fuente. Whenever he speaks I imagine David speaking spanish with a tad of an accent when he returns lol. Bebe, Glad you enjoy The Voice. I’m actually over David not winning but still something rubs me wrong. Poluck, How great that you tuned in when the best singer ever graced the AI stage! I had watched religiously since season one, but wow when I heard David I knew that something special was upon me. MT, I love Shop Around. This performance sealed the deal for me. Tawna, Is it coincidence that you decided to tune in? Who knows. David is the perfect duet partner. 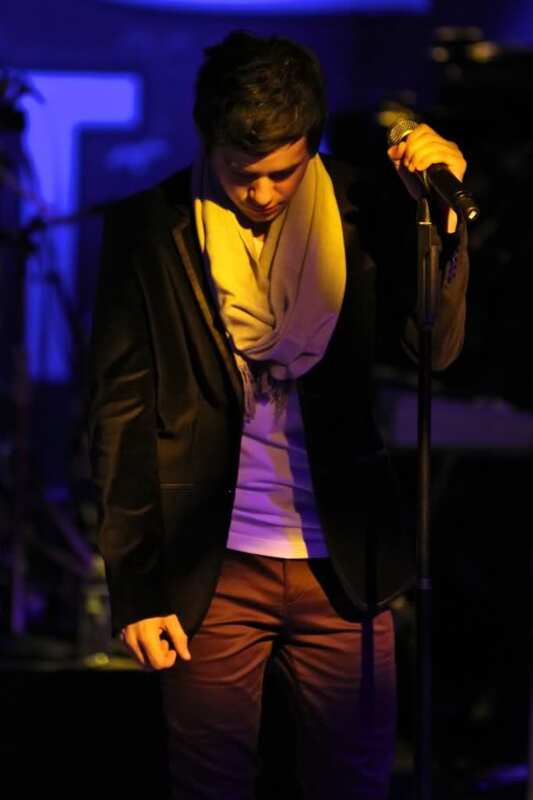 He harmonizes beautifully and is always a gentleman. The videos I posted were montages because I love watching everything he was a part of. He is so engaging with an endearing quirky personality. Oh, and I always have loved “Angels”! That was the song that helped me after my hubby passed away 2 weeks after the finale. I wish he could see him now, he loved David and wanted him to win too. In this moment, Imagine, Angels, With You, Shop Around, TLAWR, SMM, these are all toss ups for me. Also the studio recording of Shout to the Lord. Also loved Hero. It seems everyone still thinks about D.
Dja, you ask a tough question! Shop Around when they finally hit the stage as top 24 live,was amazing.David was so animated, and yes MT! the head thing, the side to side head bobble or whatever that was was priceless. ahh and Love me Tender….well I already did, by the time he sang that one, but I was like….oh..my! My wonderful Dad passed away on Monday. He was 93. I miss him so much, but knowing he is reunited with my Mom again,gives me a quiet peace.She was the love of his life. Today began my official duties of supervising my grandson, aged14, while his parents are in Key West,FL for a long weekend. I want to always instill personal responsibility and accountability to make him more self sufficient. Part of his duties is to take the dog out as soon as he wakes up. He got up and out the door to school all on his own. YAY! I got home at noon to let the dogs out. 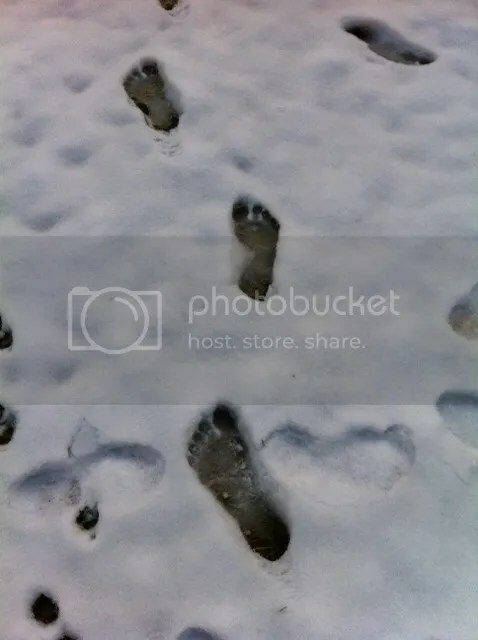 This is what I saw in the snow. My sincerest condolences on the loss of your Dad. Oh My Gosh! He went out barefoot in the snow?!? Brrrrrr is right. LOL Boy’s got feet of steel. No wonder he was full of energy and ready to go! haha Even his little toe prints are showing. Oh my goodness! !…that top picture!! What a great way to start the day! Can’t help but have a great day after seeing that smile! ((Sky))…thinking of you and sending prayers and hugs your way. SO many favorite performances from American Idol, but one in particular always stands out to me…more so for personal reasons. The night David sang “When You Believe” was a sort of crossroads for me. The words he sang and the spirit in which he sang them went right to my heart. For days afterwards, I played it over and over again, reflecting on my own situation and helping me find the strength I needed to start a journey I had known for years needed to be taken. I think it was that performance that really revealed to me that he was more than a beautiful singer; that he had a gift that could change lives and bring happiness and hope to those who were willing to listen. Jans, you “have a story with everyone of his songs”? Does your life revolve around David? LIke Tawna, I loved the duets. But it is a bit eerie how my ears seek out his voice when he is singing with someone else. Every time. My favorite from AI is Love Me Tender. The phrasing, the story telling just make this one shine for me. And Angels. And Smoky Mountain. And Sweet Caroline. Beberreder gave you my favorites from AI: Love Me Tender and Smokey Mountain Memories. Wonder if Elvis and Dolly have more good songs out there that David would be great at. I also loved his When You Say You Love Me. David has done a couple of “angels” songs but not this one. I’d like to hear him sing I Believe In Angels (by Cristy Lane). Oh, I also wanted to comment of American Idol. I also have not been able to really enjoy AI since season 7. I feel that they are making a huge mistake by showing all of those awful auditions. I’d like to see the show begin with the top 24 (or top 30 or whatever). Not sure how many weeks the show runs but I would prefer that we’d hear more from the top 4 or 6 at the end and less of the losers at the beginning of the season. I tuned in last night and found it so awful that I turned it off. I’m not going to listen again for a few weeks and then I’ll try again. But for me, there also has been no one but David. 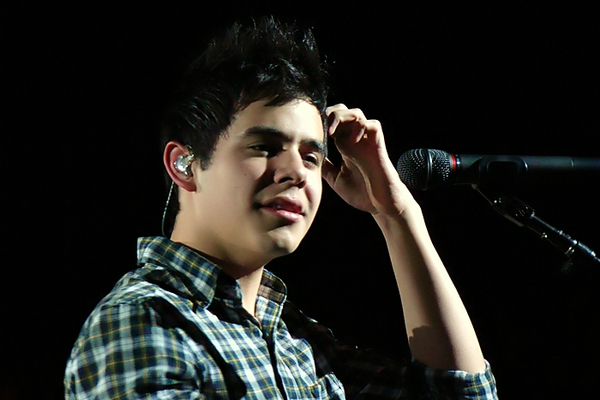 And KayCee, you’re right, I agree totally with what you said about David. I believe that people who didn’t see him on Idol and aren’t following what he’s done since just don’t get him like we do and therefore don’t appreciate his singing. To really love him is to know, as you said, that he has “a gift that can change lives and bring happiness and hope” to all who love and appreciate him. I often wonder where his life will lead him and hope I’m here to see it. I like the song I Believe In Angels too. Sky, sending my condolances for you and your family. My dad died 10 months after my mom, back in 88 and 89; think it was from a broken heart. Oh my, Dayzee, it does seem that way. 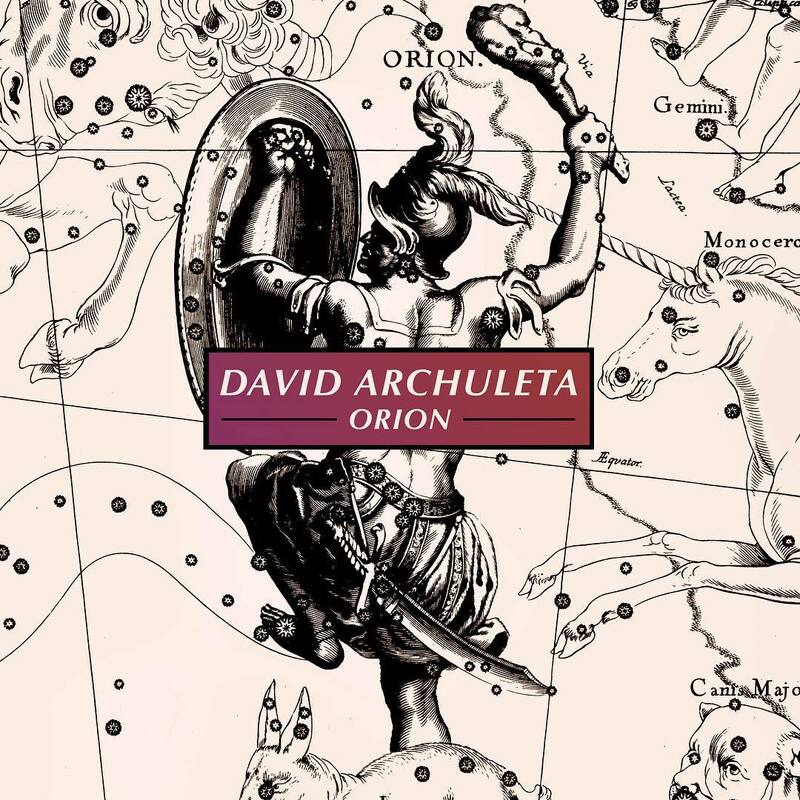 🙂 I just got so caught up with him when my Archuworld opened up to me, I read and checked out everything on his concerts and songs. Another favorite was Crazy and it was so exciting to see him live at my first VIP sing that and Heaven right about 20 ft from me. I may have watched very few of the other seasons for a week or two and that was it for me! It’s not the same without David in it. Sorry AI, but that’s the truth! I love “Imagine” a lot. I think that is very best rendition of that song that exists out there. I love “Love Me Tender” and “When You Believe”. Love the way he carressed each and every word which gives me chills and makes me want to pee on my pants. LOL! Love all the videos and pictures posted ladies! Keep ’em coming! Watching them became a ritual before I go to bed every night! Sorry to hear about your father! May he rest in peace! Prayers going out your way! Take care! I thought it was so great and wasn’t surprised at all back then when he sang it. And I thought his dancing was so cute. 🙂 I didn’t know much about him then other than that I loved his voice. Knowing what I know now, you’re right, it is surprising that he sang it. #22 I was grinning from ear to ear through that whole video. He is just too precious. Couldn’t let this AI Season 7 discussion pass by without mentioning the famous “Oh my gosh, Ashley” interview! So down to earth and totally unaffected by all the fame! Sorry about your Loss Sky. It’s nice you can see the positive. 93 is quite an accomplishment!! I think it would be easier to pick what I didn’t like of David’s performances on Idol. Was hooked from Audition of Waiting On The World To Change. This was a surprise because I was basically mad at teenagers because Melinda lost the year before. Some standouts for me were: Heaven, Shop Around, Smoky Mountain Memories, Imagine, Love Me Tender and Don’t Let The Sun Go Down On Me. 🙂 I’m sure there are others. Thanks for all the You tubes. Love these trips down Memory Lane and all the Pictures Abrra et all. Jans, I’m loving your stories!!! Martha, With You was a wonderful surprise. I’ve listened to it and CB’s, there is no comparison. David’s rich soulful voice made it better than the original IMO. Abrra, Oh my gosh!!!! What was he thinking?!!! Kids! 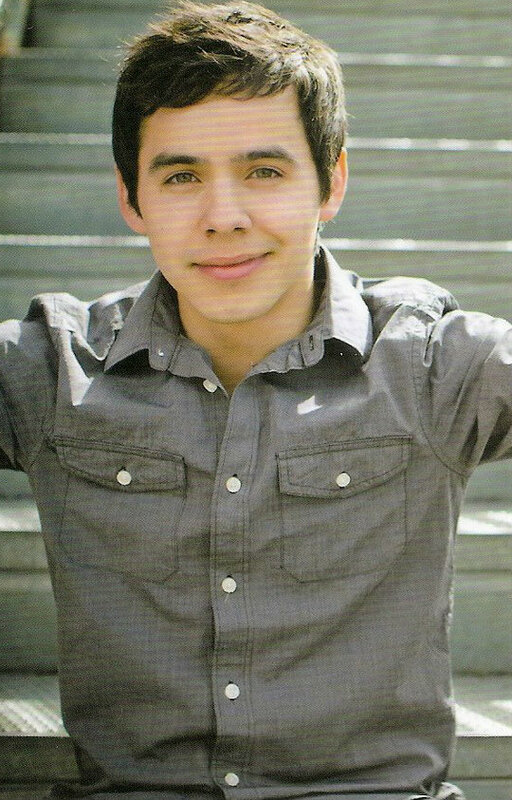 Kaycee, I was so happy to find a good quality picture of David. His joy just leaps of the screen. When You Believe is amazing. Have you heard the studio version? I love it. “So down to earth and totally unaffected by all the fame!” Just admirable. Dayzee, I’ve always loved the live performance Angels. Betsy, Thanks for that. 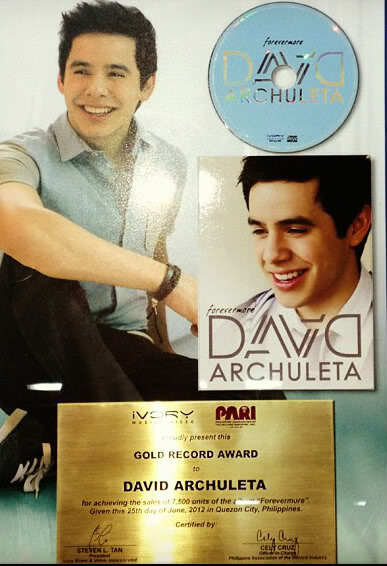 I love to see others give David the recognition he not only deserves but has earned. Jans, I hope one day we get to see Crazy from the auditions! 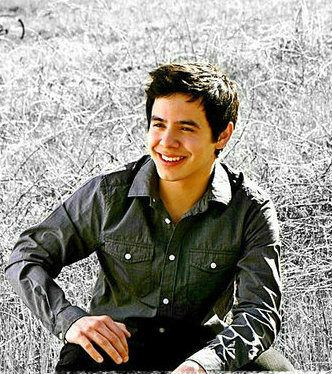 Winnie, David Archuleta’s Imagine is one of the best ever. MT, Very hard to pick a favorite anything David lol. Wasn’t Simon who said David ticked all the boxes, he sure did. Heidijoy, Interesting concept. What was my least favorite? haha have to really think about that. The trip down memory lane has been so fun. Nice way for the more recent fans to see how it all started. Thanks for the look back dja. Loving all the comments and videos. His AI performances are some of my favorites, and really, I would have to list them all as favorites. To me, they were all brilliant – and thanks to the candy jar I still play them while driving (my favorite place to listen to him.) When You Believe, both the AI performance and the studio version, slay me. After Shop Around I thought he was the best. After Imagine I thought it was no-contest. Aside from the obvious talent, I thought, wow, what a nice kid. And I was hooked. Forever. I counted four solos for our David. Sky, So sorry about your Dad. Sending love and prayers to you and your family. Sky, Please accept my deepest condolences on your loss. You are in my thoughts and prayers. Thanks Dj, I would love to see the Crazy audition too. Never could figure out why they didn’t show it when it was sang later. Heard it was something about the rights of the song. Dja and Emmegirl…yes, absolutely loved the studio version of When You Believe! It pretty much became my anthem that year! 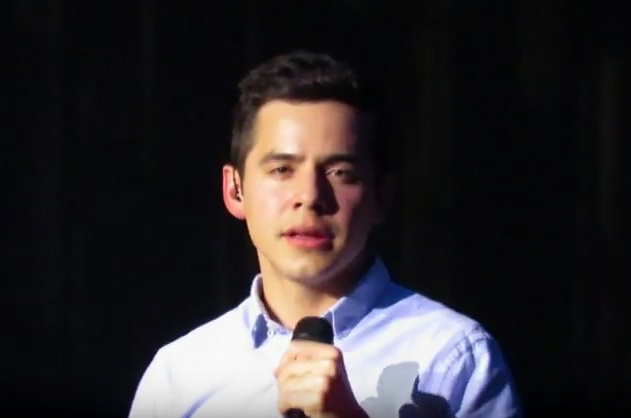 I’m totally loving all the videos and comments…discovering David during AI 7 was a magical time! Sky, so sorry. Love you too. Safe travels. Hope you find much comfort with family and good memories. This slays me. Then 53 performances on tour later, this performance of it is still my favorite. Except maybe Pippsburg. Angelica 🙂 Love your blingee and Stand By Me. Yes David we will Stand By You together!! God’s speed, Sky…you’ll be in our thoughts. Sky, so sorry to hear of the loss of your father. I do understand your positive outlook. Even though I still have my mom with me, when my dad passed a few years ago he was in so much pain that I was so glad his suffering was ended and he was again with his parents and sisters who he loved very much. Life does goes on and I believe that we will see each other again someday too. My prayers are with you and your family. I love all of David’s songs, but the ones I go back to to watch on video are, And So It Goes, When You Believe, Don’t Let the Sun Go Down On Me, In This Moment, Apologize, Smokey Mountain Memories, Imagine…Oh, who am I kidding, I don’t have favorites. They all fit that category for me. May you all have a fantastic weekend. te llevo en mi corazon. Cuándo yo supe de su perdida, lo primero que vino a mi cabeza es: hay otra buena persona mas en el cielo cuidando a nuestro David. Abrazos y besos a usted y su familia. Forgot to mention I got a kick out of the barefoot snow prints. Well, I’ve been watching Idol. It’s been … interesting. I haven’t seen anyone yet that could make me vote. But there are one or two that I will be watching. Sky: So sorry about your dad. When one’s parents are elderly, you always seem to be holding your breath, and grateful for each additional day with them. 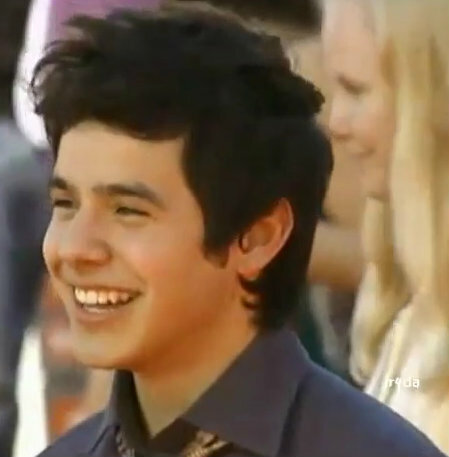 Thanks to all of you for this recap of David’s journey on American Idol. I chose to miss it when it happened–nothing could induce me to watch that show on a regular basis! I must have seen one or two of his performances, though, because I always thought “cute” when I heard his name, but I was totally oblivious to his talent. However, this many years later, here I am! And I finally understand the appeal that you all recognized then. One thing has puzzled me as I’ve been catching up on his career. As I watch various performances and interviews, I’m sometimes unable to recognize him from one time to another. 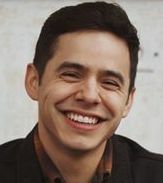 His face seems to change to me and I think, “This cannot be the same person!” Example: I see absolutely no resemblance between the David who sings “I’m Trying to be Like Jesus” and the smiley David who bounces around in “Rainbow Remix.” Then when you throw Elder Archuleta into the mix early on, it gets really confusing. 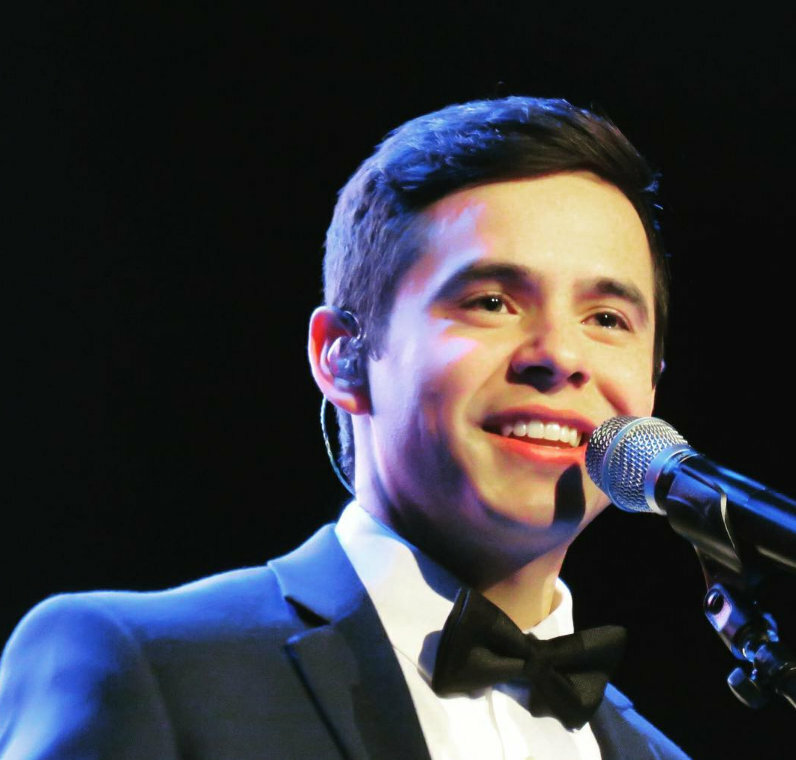 How can the sweet-faced boy who sings “Forevermore” be the same person as the Elder Archuleta with the transcendent countenance who sings “O Holy Night?” I don’t get it. Do any of you who have loved his face for so long have an explanation? Ronaleem…..I know what you mean about the many faces of David. I’m sorry to say that I have no explanation either! Since you are catching up on David’s performances and interviews, I do have a suggestion to add to your confusion. LOL Have you ever watched David’s speech at the Women’s Conference in Utah? It is on youtube (5 or 6 parts, I believe). He’s funny, charming, inspirational, endearing…….the whole shebang. 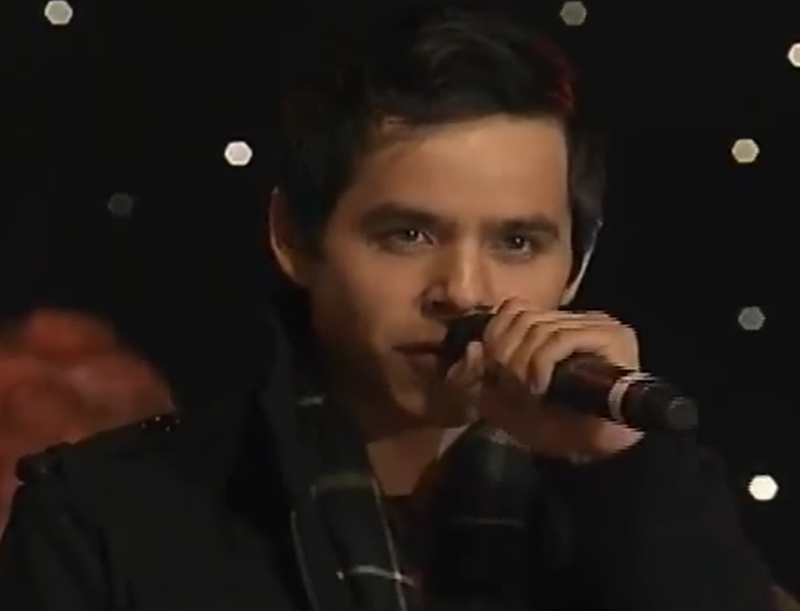 To top it off, he sings a dynamite acapella version of “O Holy Night” at the end! I can’t help you out either because I totally agree. After all this time, we still wrestle with this issue. How could he look different each time we see a new picture of him? He is a man of a thousand faces, each of them very expressive. At first I thought it must be that his hair was combed differently but realized that’s not it. I’m afraid that I have no answer. djafan…..Love your post and the spectacular picture at the top! I can’t stop looking at it with a smile on my face. It makes me think about the time David said, “Hello Mr. Sun! How nice of you to join us!” He sure is a big, old ray of sunshine!!! All of my favorite David AI moments have already been mentioned……Shop Around (when he blew the competition out of the water), Imagine (when he had me hook, line, and sinker! ), Smoky Mountain Memories, The Long and Winding Road, And So It Goes, When You Believe, Angels. The one that did literally take my breath away was “In This Moment”. I was so mesmerized by the performance…..and that note….that I didn’t breathe the entire time. I was totally spellbound. Ronaleem, I wholeheartedly agree with spirit and bebereaders comments and adding my own 2 cents is: how can a 6 yr old memorize the songs from Les Mis and sing them with the cockney accent and how can he sing songs in French, Italian, Tagolog and Latin and don’t even speak these languages!? 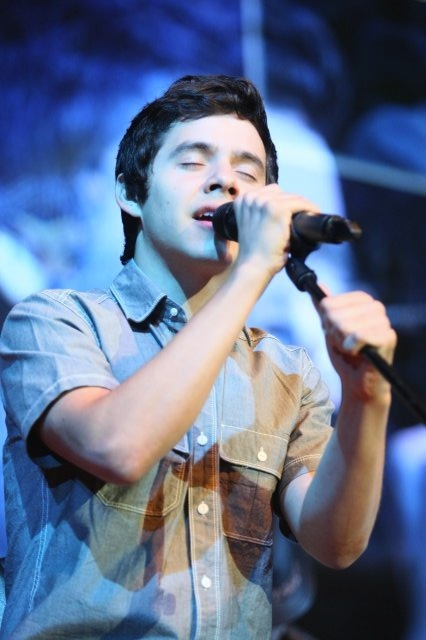 He has the gift from God and everytime I hear him sing, I am, as Spirit says, totally spellbound! I feel he even brings me closer to God and I will always be here to enjoy this ride he’s taking us on as long as my little ol’ heart beats! The hard thing is to try and explain him to someone, when they ask, that doesn’t understand him…they just don’t “get” him and I can’t help them.!! Like Spirit and Bebe, I’m afraid I won’t be much help either. After 5 years, we’re still trying to figure him out. There are so many sides to David, and sometimes I think he has a different face for each side. He’s one of the most fascinating people I’ve ever come across. I know what you mean about that song. I had recorded the finale performances and I rewound that spot over and over. I watched and re-watched the Idol performances so many times I wore out my recorder. LOL I had to get a new one. Ronaleem, I agree with you about David’s face changing. He has such an expressive face that I never get tired of looking at him. But, no matter what his expression is, he is one heck of a good looking guy!!! 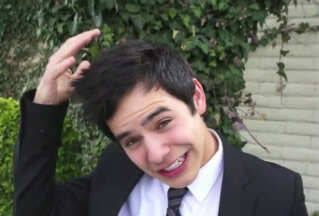 Ronaleem, I once made a video to “That Face” by Frank Sinatra, Jr. with just all those different “looks” David has. Ronaleem, it was one of the things amazed me at first, too, and one of the reasons I love scrolling down the Voice sidebars. I know all those faces are David’s, but they are all so different, I just have to shake my head and conclude……..it’s part of the Archumagic. No good explanation, so I just go with it and enjoy every one of those faces. Dja; Love hearing everyone’s favorites and I can see why it’s so hard to choose just one. Since I never saw season 7 of AI, I remember that my first google search on You Tube landed me on David’s Hollywood audition when he sang Heaven & well, I basically stayed up in the wee hours of that very night watching as many of his performance as I could. At least I didn’t have the torture of waiting week to week but it plagued me as to why in the world did he not win!?!?!?! Well, I am no closer to the answer but at least I’m completely satisfied in coming down with ODD while in the process. 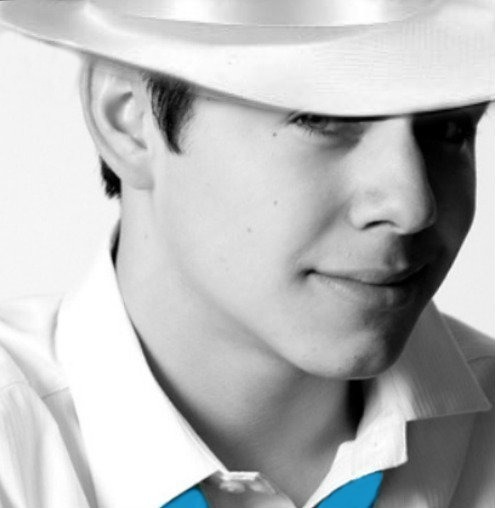 I’m with you though, if there is no David, then there is no AI for me and I feel sorry for those that sings any songs that David has covered before. I am curious to know if there were studio recordings of every AI songs that David sang or only a few such as When You Believe, Think of Me? Abrra; That acapella intro for when he sang ‘And So It Goes’ was just stunning! Did any other contestants sing acapella ’cause I can’t imagine anyone coming even close to matching that! Just have to say that the sidebar gallery of lovely photo’s equals photojournalism at it’s best. 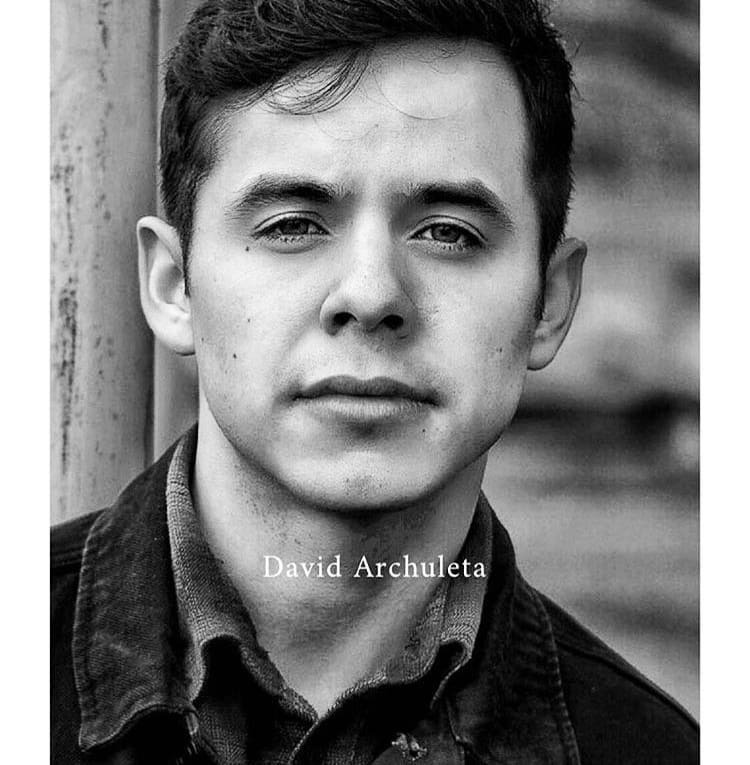 Bebe; Funny how you mention The Voice show because I remember thinking why are they using that name since it already belongs to David Archuleta? Humphhh! Loved hearing that David ‘crushed’ the competition when he sang Love Me Tender which must’ve been like every week right! Tawna; Whenever my kids hear Apologize on the radio, they are quick to point out how they are playing ‘David’s’ song! 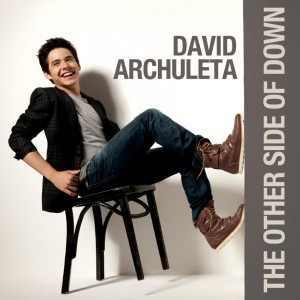 Whatever song David covers, he makes it his own & it’s so hard to listen to the original singer. Kaycee; I wonder if Mariah Carey remembers David as she mentored him when he sang When You Believe because she did say his singing was ‘just beautiful’! Yes, it is remarkable how he can touch and change one’s life as he has done for so many. Hope all is well with you! Rose; I know there are those like me who did not watch AI so I can only hope that there’s many more opportunities for David to be recognized & heard in the future because he is indeed one-of-a-kind! MT; Shop Around really brought out his playful, soulful & grooving side … what a perfect song it was for the Top 24 as I bet lots of people were hooked at that moment! MsPoohBear; Imagine was indeed an iconic performance that keeps getting mentioned as it was even on Fox TV’s 25th Anniversary special last year! Angelica; Your creativity knows no boundaries … blingee art indeed! Ronaleem; I want to add my warm welcome to you! Though it may define explanation, enjoy the wonderment of having ODD and know that you are in good company. Ahhh, besides the many expressive faces of David, I dare say that the colors of his eyes change as does the glow of his skin and even his age, looking one minute like a ‘kid’ then like he belongs on a GQ cover. Bebe; Loved Dakgal’s clever explanation! MT, Spirit, Jans, SuzyQ …. my take is that he is the human chameleon, lol! Marlie; Would love to see your video of That Face of David’s! ByChance … on the other hand, I like your ‘Archumagic’ explanation better! Ronnaleem – There was once an interview of JambaJim (Jim Cantiello) by Josh Skinner. They were talking about David. Jim had interviewed him and they went around singing Christmas carols at MTV’s offices. Josh asked him if D was really like that, oh gosh, etc. He said yes, but the second he sings, he matures by decades and all nerves are gone. (he actually glows in person) and reflects back, which changes his face. It’s just him. There was mention on TV this morning of a name given to exceptional people that are gifted in different ways. The name is for the light or colors or looks that people see when watching them perform or whatever they are doing. I didn’t have it taped so I lost the word. It is not our imagination and it is real. I am going to try to find the name it has been given. I get tears in my eyes each time I watch the performance. My heart feels like it’s being squeezed. My jaw goes slack and my hand goes automatically to my mouth to stop me from crying out. The yearning in his voice and each audible intake of breath make him seem so vulnerable that I want to envelope him in a big hug to comfort him. And when he sings that final “always” with the almost unvoiced second syllable I melt and turn into a puddle of goo. If I remember correctly, Bo Bice sang an entire song acapella on AI and it was pretty good. Thanks, I knew there was one that sang a song acapella but couldn’t remember who. You’re right about it being Bo Bice. I looked it up on YouTube after reading your comment. He sang In A Dream. Hey, now! How did that happen? I didn’t post that video in 62. Did I? Well, if we’re gonna have an acapella performance, you now we need a DA one, right? This is a funny story. So David! (((Fenfan))) You put that SO right. Exactly how he made us feel with Love Me Tender. That was the same night he did Stand by Me and then, WHAM! A one-two punch that crushed the competition and smelted us all into goo with you. ♫ withyouwithyouwithyouwithyouwithyou ♫ ◄ I loved that one too. But that week of SBM and LMT was just exhilarating and I remember carrying the feeling for days afterwards. Click the link to go there. 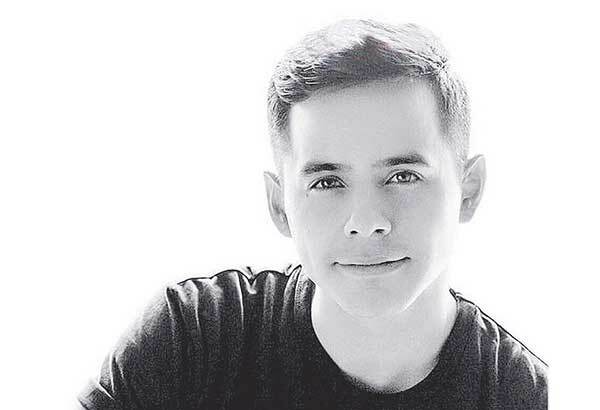 51…Lazaro…Not David, but very gifted too. Such a sweetheart. Hope he can go a long way and I’ll sure be watching him this year. 62 Mt, I agree, he does “carry the melody in his voice”…very good explanation! 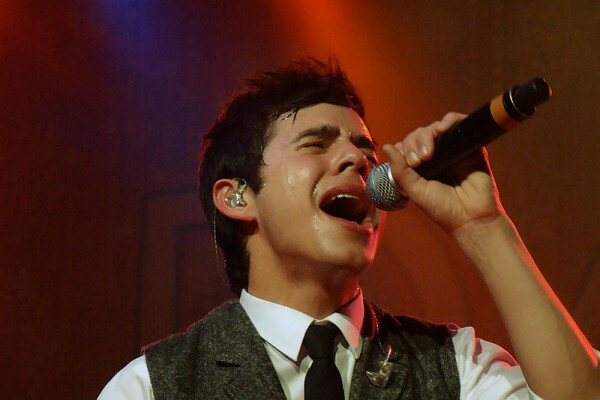 65…Angelica…he does know how to put feeling in a song and transfer it right into us! Like he said in his “Heaven” audition, I’m going to tell it to the judges and make them understand it”! Without doing a search, what does ‘Shorty’ represent?